For as much as I've always loved dragons, I noticed a distinct lack of them in my grander Fantasy Art. I had plenty of tattoo designs, small illustrations and logos, but very few pieces like this old one to the right (which eventually became a tattoo as well). I did have my very grand Ink-Wash of Twin Dragons, but what was truly needed was a series. 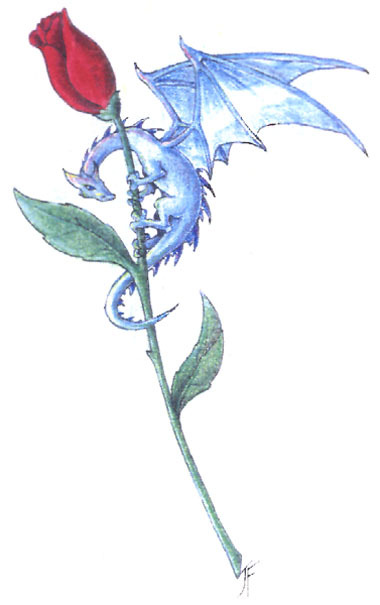 This decision being made, my first was Misty Mountain, which launched the concept for the series, the color dragons based (loosely) on the Dungeons & Dragons catagories. Rather, I'm using the reference point of the D&D dragons' breath weapons to determine the background and posing of the creatures. It's my own muse that decides the feel of each piece. As it is intended at this stage they will consist of the Green Dragon (mist: majestic and ancient), the Red Dragon (fire: enormous and fierce), The Blue Dragon (lightning: sleek and beautiful), The White Dragon (ice: feminine and serene), the Black Dragon (acid: sinister and haunting), and the Purple Dragon (a new Faerie Dragon). Here's hoping you enjoy the series as much as I do!